An outstanding and rare 18th century Gustavian period tragsoffa retaining its beautiful original time worn blue grey patina and featuring a decorative hand carved Guilloché scrolling apron with rosette topped tapered legs. Complete with a comfortable seat pad with piped edge and removable cover, and a trio of oblong scatter cushions all newly re-upholstered in gorgeous 'silver birch' linen. 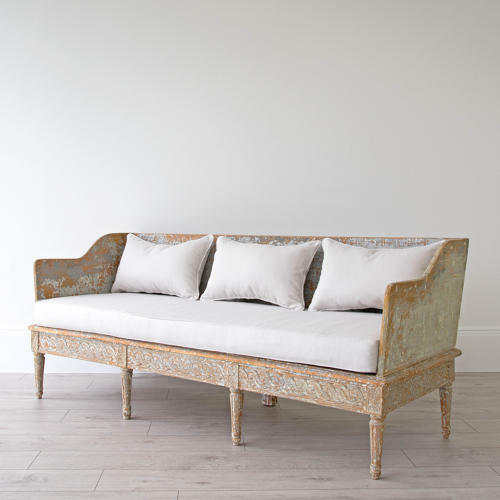 A timeless antique sofa that would grace any room. Swedish circa 1790.